Put dried mushrooms in pot with 7 cups of water and bring to a boil, then simmer for 20 minutes until broth is a rich dark color. Heat butter in a large saucepan over medium heat, add shallots and cook until tender. Stir in rice and stir until coated with oil about 2 minutes. Add the wine and stir until the wine is cooked off and absorbed. Add the broth one ladle at time, stirring constantly until the broth is absorbed. Continue adding broth until rice is fluffy, tender and creamy. And finally, sautéed mushrooms and parsley. Enjoy with a nice bottle of Murvieta Reserva from Rioja!! Risotto is a staple in my home. I feel it is truly the perfect blank canvas. When thinking about what to pair with the Rioja Murvieta Reserva 2010, I knew something earthy and comforting would do the trick. We are fortunate to live during a time when mushroom varieties abound. We are no longer subject to just the generic button mushroom. I used dried shitakes to make the broth for the risotto and then three different mushrooms – maitake, shitake and oyster mushrooms. 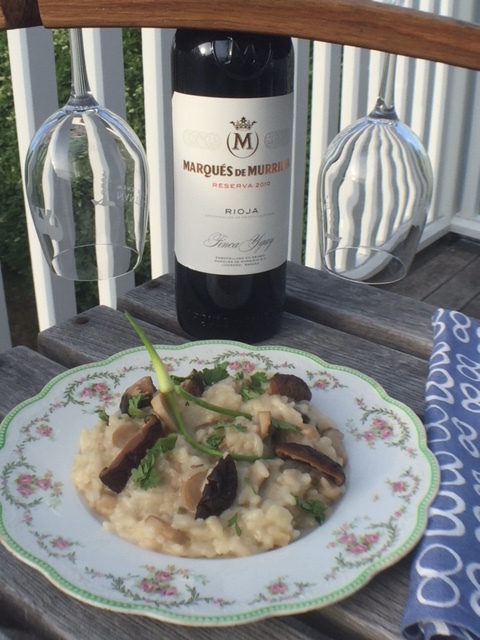 The combination of mushrooms is lovely and the risotto was delightful alongside the Murvieta Reserva 2010. You can use any mushrooms. Buttons would work. I like to mix it up!